PARIS (France 24/Pacific Media Watch): American internet giants Google and Facebook announced this week that they would be partnering with French media this month to offer tools that combat “fake news” online, ahead of French presidential elections in April. Facebook and Google plan to work with eight French media brands in order to fact check and flag hoaxes, conspiracy theories or propaganda — often called “fake news” — mirroring similar efforts already under way in the United States and Germany. The partnership will begin on February 27, and will involve Le Monde, Agence France-Presse, France 24’s The Observers, BFM-TV, L'Express, France Télévisions, Libération and 20 Minutes. Facebook will offer users the option to flag a piece of content they see on the site as questionable. 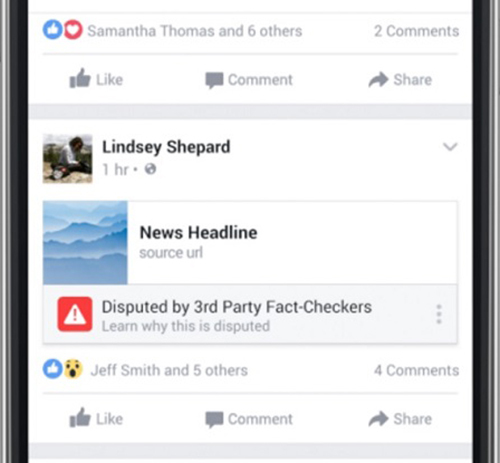 If two of Facebook’s media partners confirm that the content is incorrect, it will carry a “disputed” label from then on. French daily Le Monde said the collaboration was "an experiment". At the same time, Google will be partnering with the nonprofit First Draft News to launch CrossCheck, a verification project aimed at helping French voters "make sense of what and who to trust online". Google News Lab, the company’s media division, will head the partnership. With the first round of the French presidential election set for April 23, Google and Facebook are expected to come under increasing scrutiny over the spread of fake news. Facebook in particular was accused of allowing the publication of bogus and damaging articles that helped Donald Trump win the US presidential election. The company began experimenting with a fake news tagging system on its American site following the 2016 US elections. Submitted by Mark Perkins on Thu, 09/02/2017 - 6:07pm.